Uglyworld #441 - Ice-Bat and the Nom-Nom's (98-365), originally uploaded by www.bazpics.com. Orange Ice-Bat had mysteriously gone missing over the last few days, so before leaving for work this morning I decided to try and find him (I was getting worried that he wouldn't be able to find food for himself and could end up starving while I'm working long days). I searched high and low (with the help of several other Uglies) and we couldn't find him anywehere, so Babo had the brainwave (as always) to have everyone stand perfectly still and silent. 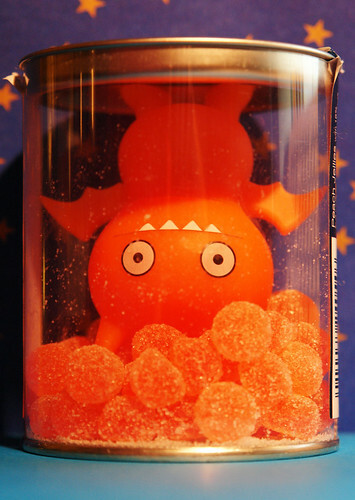 Feint sounds of "nom, nom, nom" could be heard from the kitchen, so we silently crept upstairs and found Orange Ice-Bat inside a tub of peach sweeties. When he began to feel like a goldfish inside it's bowl due to us all staring at him, he popped the lid open and said "wassssssup" to which Babo replied, "Alls is ok's with you?". "Yup, just nom'ing on some nom nom's". At least we managed to find the little guy and make sure he was ok.
Are you sure this was an orange bat? Maybe the color is just an allergic reaction on the orange noms? Check all your bats see if Blue is missing.